Those who’ve visited this site since its earliest days may remember Sam George, one of our earliest contributors. He was already enjoying a pretty good following over on r3verb when he started writing on The Hub. He then partnered with Whitney Sides Mitchell on bham.fm (the site URL is now used by a company in Birmingham, UK that books bands in the region) before eventually becoming a contributor and then editor in chief of Birmingham Weekly for a little over a year. He helped to co-found and launch a new music festival last spring, Secret Stages (BTW – this year’s edition is going on Friday and Saturday, May 11 & 12). Yeah, we thought you’d remember. He’s been staying busy getting ready for this year’s edition of the music festival – and a few contributions to Weld – and we kept wondering why we hadn’t heard much from him recently. Hey guys! It’s that time again… five questions from yours truly. Who’s this week’s target? Why, one of our favorite blogger/musicians, former Terminal contributor Sam George! 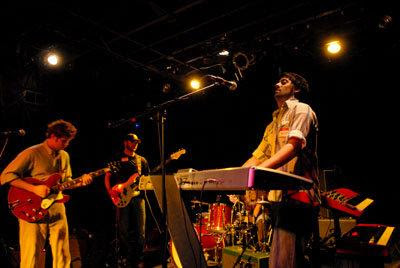 His band Bright Henry is playing Zydeco tonight and therefore, we aim the spotlight in his general direction. WHITNEY: Bright Henry performances are always so warm and lively. It seems like a collective. How did the idea for all of you guys playing together come about? I have to admit, I got my guts ties in a knot over some of the tunes in town this weekend. The show I’m most excited about is Saturday’s pick. How often do you get to go to a real, old-school soul show? Bottletree has not one, but three excellent southern soul legends on the stage for your listening consumption. But let’s begin at the begee, shall we? Another weekend is upon us. I can almost hear the collective sighs of the populace as they prepare to vent their pent-up frustrations into the atmosphere. What better way to facilitate said release than to head to one of the following shows. Music: It’s good for what ails ya. Take one, and call me on Monday.